Discussion – NOTE: Obviously, we will not be going over every verse of every chapter in this section. Instead will do an overview. This will be how the rest of the year will be; rather than a verse by verse study, we will be summarizing the main points and looking at key stories. Remember, though, that older students should be required each week to read all the chapters for each week.For this week the reading will be Genesis 31-39. Gen. 32:22-31 – After Jacob sends everyone else on ahead what happens to him? (vs. 24 – A man wrestles with him until daybreak) This is a very strange and mysterious confrontation. Who is Jacob wrestling with according to verse 30? (The Lord God – a pre-incarnate appearance of Jesus Christ) Several important things happen as a result of this encounter with God. What happens to Jacob physically that stops the wrestling? (The Lord touches Jacob’s hip and he becomes lame – vs. 25, 31) God also changes Jacob’s name. What does God say is Jacob’s new name? 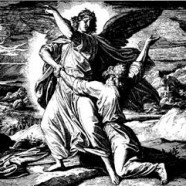 (vs. 28 – Israel) “Jacob” means heel-catcher which harks back to his day of conniving and trickery. His new name, “Israel”, means “he struggles with God”. Why does God name him this according to vs. 28? (He had struggled with God and overcame) Jacob realizes that he has had a face to face confrontation with God so he names the place, “Face of God”. Gen. 33. How does the meeting with Esau go? (vs. 1-4. They reconcile and Esau and Jacob embrace and weep) Esau has also prospered during the separation and does not want to take all of the gifts, but Jacob insists. Jacob and Esau part and Jacob settles down in Shechem (find it on a map) after buying some land. List the ways that you see God working in the life of Jacob during his time with Laban (chapters 29-31). What things has he had to learn that he hadn’t when he was at home? Be specific and list examples (look carefully at what Jacob’s assessment of his life with Laban had been like in 30:38-42). What things is God using in your life to mature you? Is your maturing process a result of trouble and conflict, like in Jacob’s life? What do you think God is trying to tell you? Many of us have times when we “wrestle” with life and God. Unlike Jacob it is not a physical struggle, but nevertheless we can learn just as much from them as Jacob did in chapter 32. Make a chart like the one below and fill it out to help you sort out your struggles with God.